This is the 1st article is a series about a major new market trend, the Experience Economy, and the significant opportunity it represents for the photography industry. What do Starbucks and Apple have in common? They’re both wildly successful companies in highly competitive and commoditized markets. In spite of that fact, each commands a premium for its products. Why are they so dominant over their competitors? The answer? They are selling experiences. 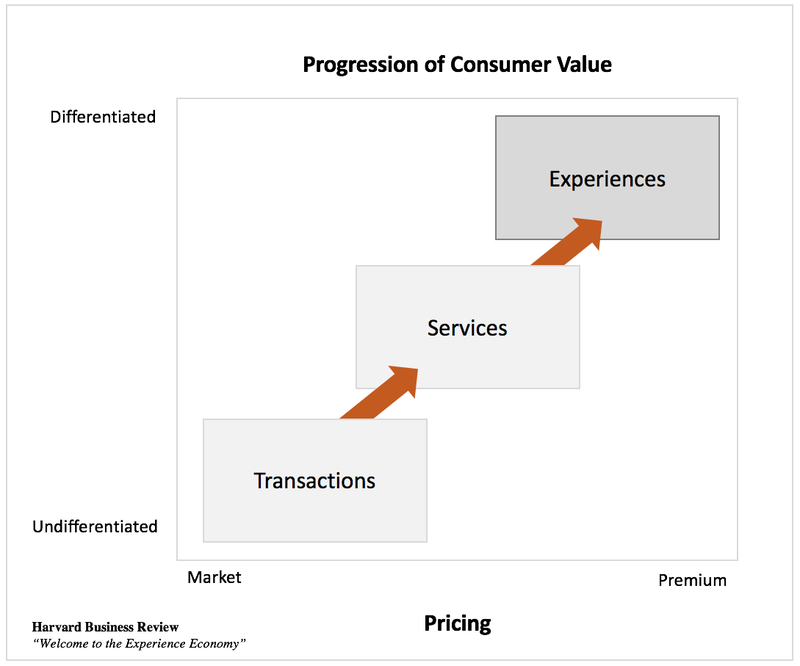 Welcome to the Experience Economy. Let’s use coffee as an example. Coffee beans are a commodity. Folgers charges you about 27 cents to brew your own cup of coffee. The local convenience store provides the service of brewing a cup of coffee for about $1.30. Starbucks, who has designed an experience that attracts many more customers, gets an average of $4.50 per cup of coffee. Starbucks accomplished this by creating that "3rd place" — beyond office and home — for people to comfortably congregate and work. They've made it a place where people meet to socialize or conduct business conversations — so their operations and the design of their stores support that big idea. They have successfully moved from selling a commodity to selling an experience, and they are commanding a premium price with that business model. These companies are among a growing chorus of businesses that recognize that consumers of all ages are opting for experiences over things, with millennials leading the charge. 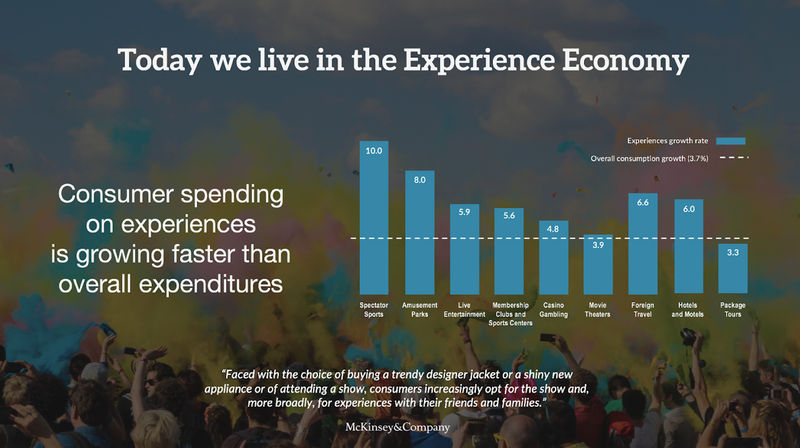 As a recent McKinsey report illustrates, expenditures on experiences—such as attending spectator events, visiting amusement parks, and traveling—have grown more than 1.5 times faster than overall personal-consumption spending and nearly 4.0 times faster than expenditures on goods. This is easy to understand when you consider how smartphones and social media have radically changed the way people interact and share life memories. Because of social media, we live in an increasingly crowded and connected world where people want to share their identity — what we like and care about, things that make us laugh or cry, what inspires us, amazing things we've done or places we've been. Increasingly, social media posts about memorable experiences have become incredibly valuable to people. People want experiences memorialized and shared. 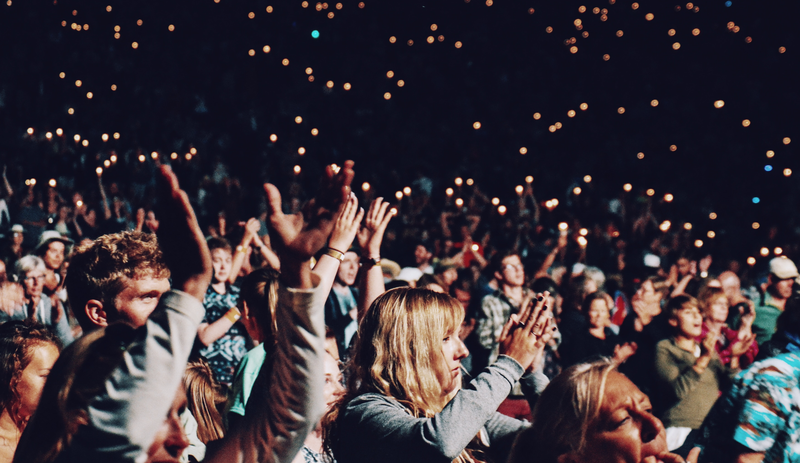 Consider some of the most popular experiences that people attend. Festivals, concerts, school events, amateur and professional sporting events, endurance races, vacation destinations, theme parks. What do they all have in common? They all have professional photographers capturing photos of the attendees. They all have something else in common. They are currently selling transactions, not experiences. While everyone has a smart phone with a camera, professional photographers have distinct advantages that drive significant value in the experience economy. They have the creativity, experience, access, perspective, equipment, software, and techniques that consumers very much value. To realize this potential, photography businesses, including school and sports volume photographers, need to move from treating memories as commodities and transactions to creating memorable experiences. By aligning with the consumer’s insatiable appetite for mobile memories they can share, photographers will unlock a goldmine in the booming experience economy. Stay tuned for upcoming blog posts in this series, including how photography businesses have made the transition and are thriving and specific ways that you can move from transactions to experiences.